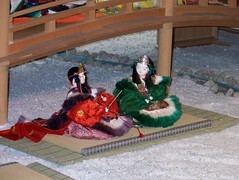 Off to Yokohama for the Worldcon in a bit, but here are some photos from Kyoto. 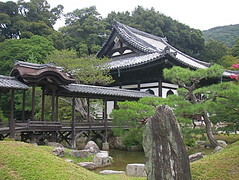 Part of the Kodai-ji temple complex. None of these wooden buildings is, in fact, very old -- every place you visit, they have a list of all the times it has burned down and tell you when it was last rebuilt. 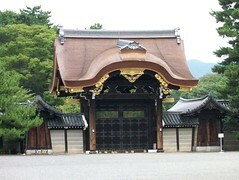 The Kenshunmon Gate (although "mon" means gate anyway) to the Kyoto Imperial Palace -- this is the one for use by the Emperor's family. 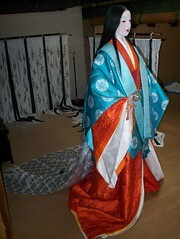 At the Kyoto Costume Museum, flick had me take lots and lots of pictures. 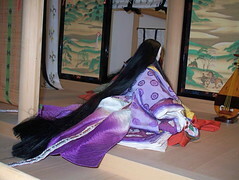 Most of these are dolls about a foot high -- the last two are life-size. 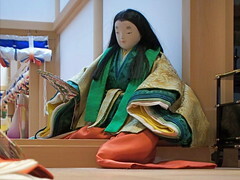 We asked if they had similar dolls for sale, and the attendant told us that each doll cost 100 million yen to make (a bit under £500,000). 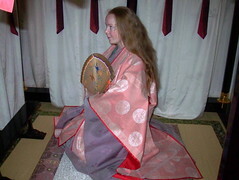 We think she must have meant 100 thousand yen, or £500. 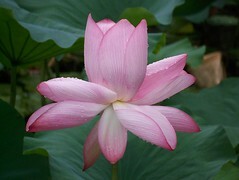 Finally, this lotus flower was in a moat outside the Higashi Honganji Temple. 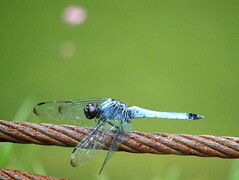 seph_hazard has set up an LJ feed of my Flickr photostream at drploktaphotos. If anyone is following my Japan photoset on Flickr, note that I'll be creating a different set for Worldcon photos.